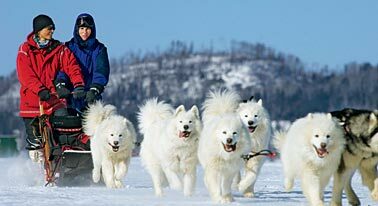 U.S.-Canadian border, behind an eager Samoyed team. TAILS ALOFT AND TONGUES WAGGING, the dogs charge dead ahead. Musher Linda Newman has other ideas. "Gee, Klaus!" she shouts. "Gee, Tuloon!" The lead dogs hesitate, then keep trotting straight, following the course of least resistance. "No," Newman calls, and stamps on the sled's brake. "Gee!" We're on a 22-mile guided dogsled run across snow-covered Gunflint Lake, in the northern Minnesota woods on the edge of Canada, and Newman is training her two new lead dogs--and me. After several fits and starts, the dogs finally get the message and hang a right. "Being the lead dog is stressful," Newman says. "They have to listen to commands, figure out where to go, and tolerate the other dogs chasing them." I don't say anything but I'm feeling a touch of stress myself. I'm from California and unnerved by the Minnesota cold, despite Newman's generous loan of extra layers and boots. I'm also a bit spooked by another musher's tale of being dragged cross-country behind her team when it caught the scent of a fox. And soon I'll be soloing on a careening sled, yelping orders in a language I'm only beginning to understand to a not necessarily cooperative canine crew. But then small steps and lots of support are the ideas behind this women-only dogsledding trip by Newman's adventure company, Points Unknown. "I married into sled dogs," Newman says. "My ex-husband had them, and I was thrown to the dogs. I didn't want anyone else to have to learn that way." Newman had trained Australian shepherds on agility courses and initially considered northern working breeds like huskies too stubborn. One day while volunteering at a private educational wolf center, she got entangled in a wolf fight--and walked away with a nasty bite. From then on, she says, she got scared when she saw her ex's aggressive, poorly trained Inuit dogs tearing into each other. Newman worked through her fears by applying her dog-training background and eventually, she says, "fell in love with the dogs." Now she raises them herself and has rearranged her work--as a real-estate appraiser and beeswax-candle maker--to spend as much time as possible with her pups. Over a few days, our small group will learn plenty about this arcane winter sport and the survival skills that doing it poorly might very well bring into play. One of the mushers, a modern-day Thoreau who lives in a small cabin without running water or electricity, teaches us commonsense wilderness tips: Be prepared (bring spare clothes, a first-aid kit, compass, mirror, and matches) and knowledgeable (learn how to tie knots, start a fire, and use a compass). An orienteering guide helps us connect with our inner Magellan, but when we venture outdoors to test our newfound navigation skills, I'm immediately fuddled and miss the first trail. With a little help, I get my bearings, and we climb to the top of a small ridge where we get another lesson: Maps are imperfect. What looked like a shortcut to the lodge turns out to be a 300-foot cliff. Our guide takes advantage of the expansive view to point out the extent of the wildfire that ripped through the area in 2007. Then she makes use of the snowy clearing to demonstrate various fire-starting techniques, using cotton balls swabbed with Vaseline and shaved magnesium as fuel, sparked with a flint. Where to Go: Duluth International is the closest U.S. airport to the Gunflint Lodge. Take your time driving along northern Lake Superior to savor the powerful cold that freezes the lake and to marvel at the jewel-like ice formations that crumple against the shore. Grand Marais, Minnesota, is a quiet burg that offers comfortable lodging and locally produced arts and crafts at the turnoff to the Gunflint Trail. Such wilderness skills, while potentially lifesaving, are unnecessary on this trip. We're ensconced in a snug cabin at the Gunflint Lodge, run by the Kerfoot family since Justine Kerfoot and her mother bought it in 1929. Any appetite we work up is quickly slaked by our personal chef. We can dunk into the hot tub or schedule a massage to salve our weary bones. But for a dog enthusiast like me, the pooches are the trip's highlight. Some are shy, not used to visitors, and huddle in their plastic shelters when we serve them dinner--kibble, warm water, bones to gnaw on, plus a spoonful of fat as a treat. Most are pleased to get a good scratch, and a few seem eager to push me into a pratfall on the slick snow. The new love of my life, though, is Ilu, a huge, smoky Canadian Inuit dog who looks like an overgrown bear cub and sounds like Chewbacca--but has the personality of a Labrador. He jumps and strains to greet me, and as soon as I get close, he gives me a bear hug with his front paws on my shoulders. He's surprisingly light and gentle. His craving for a neck and ear scratch sated, he slides to the ground for a belly rub. Newman also raises Hedlund and Alaskan huskies. Her other mushers--one has a day job developing chemical assays in Chicago, another is a dog trainer from North Dakota--have Siberian huskies, Samoyeds, Alaskan malamutes, and mixed breeds. "Dogs represent a lot to me," Newman says. "Loyalty, unconditional love--combine that with adventure and wilderness, and it's a spiritual experience." ON OUR TRAINING RUN, Newman shows me how to step lightly on the bar brake on downhills to tauten the gang line that connects the sled to its four-legged engines. Press too softly and the sled can jerk or ram the "wheel dogs," the team's brawn. Apply too much drag, and the sled stalls. Mess up either way, and the dogs let you know with a disdainful backward glance. Running hard through the snow can tire them, though. The musher takes note, barks "Whoa," and drops a hook to stop and let them rest. It's smart to stand on the anchor: The dogs may nibble at the snow, but they recover quickly and are soon lunging against the claw brake. After a long day on the lake, facing a headwind on our return, the human students wear out before the canines. Most collapse in the cabin, refortifying themselves from the massive pan of mega-chocolate dessert the chef concocted earlier. I seek solitude outside. The setting sun glistens lavender and gold on the frozen lake. The lake groans and creaks; my footsteps shatter the crust like glass, sending shards skittering. Snow sounds different when it's this cold, I discover: It squeaks as I climb back to the lodge. The next day the dogs start barking and tugging at their leads as soon as we walk into the yard. I'm shocked by how comfortable I've become in the cold, peeling off layers like it's springtime. But as we prepare for our solo dogsled runs, I realize I'm not really acclimatizing--it's just my adrenaline kicking in, warming me as it frazzles my nerves. The cacophony ratchets up when we approach one of the sleds. The dogs howl and jump. Ilu chimes in with his Wookie commentary and the Samoyeds yap excitedly, their high-pitched yammering rising above the barks. The dogs couldn't be saying, "Pick me! Pick me!" more clearly if they were speaking English. Our route starts at the base of a steep knoll near the dog yard, then loops through the rolling hills above the lake, through a mixed woodland of conifers and aspens spotted like dalmatians. We'll use a lightweight sled that bows and leans, easily throwing a novice musher off balance. Newman warns us that we can't be sled potatoes--we'll have to jump off and run up the inclines. She also admonishes us not to let go of the sled (the dogs could be badly hurt by a runaway). Dogsleds don't have reins, so control is limited to voice commands and trust between musher and dogs. Although Newman has positioned people at strategic points along the route to discourage the dogs from racing off-course, I visualize myself bouncing off the sled runners and being hauled through the rocky terrain. At the starting point, Newman asks one of her mushers to bring up her fresh, eager, and relatively inexperienced dogs. The musher glances at her team, straining and yelping to be hooked to the sled, then at us. "You're gonna send them out with these dogs?" "They'll be fine," Newman says. Her voice is calm, but my stomach clenches as she issues some last-minute instructions. I remind myself to breathe. When my turn comes, Newman releases the three dogs. I step off the brake and we rocket forward. As we charge toward the hill, the two lead dogs stop to snarl at each other, baring their fangs. The momentum is carrying the sled into the wheel dog. My reactions are sluggish, but I remember: Brake! I stop within a whisker of the dog. "No!" I command and jump off the runners. "Let's go!" And as quickly as it started, the altercation is over and we're dashing ahead, panting as we crest the hill. "Whoa! Whoa!" I holler at Phoenix and Tuloon at a tight U-turn. The dogs continue to heave forward, excited by the sight of a long downhill. As I wrestle with the sled--only 20 pounds but feeling much heavier in the rough terrain--the musher stationed nearby lunges for the lead dogs' line to keep them from pulling the sled out from under me. I take a deep breath, remembering the fundamental rule (don't let go! ), and with a quiet "OK, guys," we're off again, hurtling down the trail. At the next bend, I recall more of Newman's advice. I let up on the brake before I hit the turn and "crack the whip" as the sled swings out behind the dogs. I crouch low and hold on tight, yowling, "Yaaahh-aaahhh-aaahh!" "Slow down!" one of the mushers calls on the final straightaway. "On by!" shouts another, to keep the dogs on course. With the sled back in sight, the yard again erupts in barking. The welcoming committee passes in a blur as I pull in, with my team and sled intact, exhilarated that I didn't violate dogsledding's cardinal rule. I'm happily covered in fur when I stop to thank Newman for her help. "People often start out scared," she says. "It's great to see women's confidence build when they learn that they can do it." Something catches our eye and we look up. A bald eagle glides across the colorless sky--a symbol, we agree, of this newfound strength. Debra Jones is Sierra's managing editor. Her dream is to have a dog team of her own. 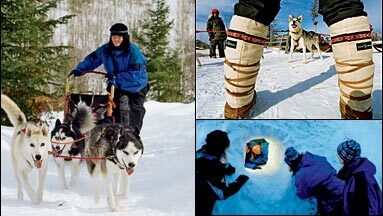 ON THE WEB Points Unknown offers dogsledding and winter survival classes in northern Minnesota. 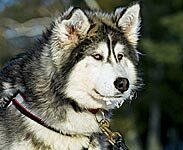 Sleddogcentral.com lists dogsledding rides and schools nationwide. To read about a hardy outdoorswoman's early years at the Gunflint Lodge, pick up a copy of Justine Kerfoot's Woman of the Boundary Waters. Photos by Layne Kennedy; used with permission.